Grease a 12-cup muffin pan or insert paper liners. Combine dry ingredients in a bowl. Stir well. Add liquid to dry ingredients all at once. Fold gently – do not over-mix. 18 Comments on "Flaxseed Muffins"
Jenny, one quick question, please. 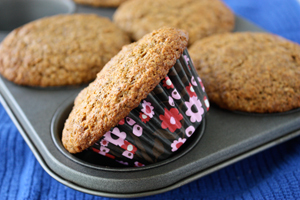 I just made your flaxseed muffins and, as usual with your recipes — they turned out Great! But, I wondered if you use/recommend the dry roasted flaxseeds or the raw ones? You can buy them either way. (I think the dry roasted are more popular because they are prevalent). I have both, but I ground fine and used the dry roasted. Whatever the factor, these flaxseed muffins turned out high-topped, light & fluffy, with no overbearing flax taste. Otherwise, I stuck to your recipe religiously since it’s my first time making these. Who knew super-healthy flaxseed muffins could taste this yummy? Once again, thanks so much, Jenny! Sending photo to your blog. I use Spectrum Organic Ground Flaxseed which contains “cold milled ground flaxseed.” I hope that helps because I don’t know if they are roasted or raw, but I would guess they are raw. For the oil, I used half vegetable oil and half olive oil because I didn’t have enough vegetable oil. For the sugar, I used 1/4 cup white and 2 tablespoons sucanat, mostly because I like the richer flavor of the sucanat. For the maple syrup, I used 1 tablespoon of honey, because I have a “thing” for trees and I don’t like the way maple syrup is collected. One muffin is incredibly filling, and I look forward to it for my breakfast tomorrow. Thank you so much for this recipe! …why are we instructed to combine the wet ingredients in a measuring cup instead of a sm bowl? To clear our pantry, I substitute 1/2 cup cinnamon applesauce (without added sugar) for the oil. I have added 2 Tablespoons light olive oil at times. Plus I add 1/2 teaspoon ground cardamom. When I run low on maple syrup I have used as little as 4 Tablespoons and no one in the family notices they are less sweet! Awesome muffin, freezes well. I’ve made a few batches of these so far, and both my husband and I LOVE them! I am so very glad that I found your website. I couldn’t find whole wheat pastry flour, so I made a little change… used the regular pastry flour, then instead of the 1 c. all-purpose, I used 1/2 c. all-purpose and 1/2 whole wheat flour. It worked just fine. Another time, I decided to use a little less oil, so I made them with 1/4 c. oil and 1/4 c. applesauce… still plenty moist and yummy. Just found your blog! I tried the no-kneed bread and it came out fabulously! I went to a second hand shop and bought a crock liner for $4.00. Now I don’t have to worry about my good crock pot cracking! 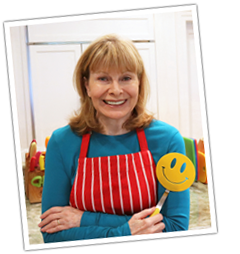 I love your site and I am going to try many of the other recipes also! I had to use two substitutions which worked great. I had no whole wheat pastry flour so I used organic whole wheat sprouted flour and I had no buttermilk but I had buttermilk powder. I used the same amount of the flour. For the buttermilk powder the instructions say 4 tbsp powder and the remainder as water which is about 3/4 cup. I added the powder to the dry ingredients and the water to the wet ingredients. I was very careful not to over mix the batter. The muffins came out light, airy and flavorful. Given the dense ingredients I was happily surprised. I can’t wait to serve them for tomorrow mornings breakfast along with some turkey bacon. These muffins are awesome! Your recipes are healthy yet delicious! Thanks for sharing your recipes Jenny!! I am using wheat germ for mine. And u can make your own w w party flour by using 1 cup we flour take out 2 t bs of flour an add 2 tbsp of cornstarch . There u have it. I am going to try to use 3 t bs of water with 3 tbsp sucanat subs. for the maple syrup. I will let u know how it goes. hi Jenny, I want to bake this but I don’t have wheat bran, what can I use to substitute it? Thanks a lot. It’s hard for me to suggest changing my recipe because I don’t know how it will turn out. Sometimes, even a small change in baking can cause a recipe to fail. It’s possible you could use some wheat germ or a bran cereal but I don’t know how much. I’m not a recipe developer – just a home cook posting my recipes. You might be better to look for a different flaxseed recipe that does not use bran. Can the maple syrup be substituted with something else? You could try molasses (like in my similar bran muffins) or possibly honey. Hey Jenny, I decided to make these muffins and I mixed up my organic pastry flour with the whole wheat pastry flour. So, on my first try, I used the regular pastry flour. i don’t know how this is going to come out…hopefully just fine…we’ll see. I’ll definitely let you know. Well, they actually came out okay. Next time, hopefully I’ll be more careful though. Love using flaxseed and usually put some in my cookie and bread recipes. It’s easy to sneek into smoothies too. Thanks for the recipe Jenny!